Another very successful visit to the Towers has taken place on the weekend of the 24-26 March. 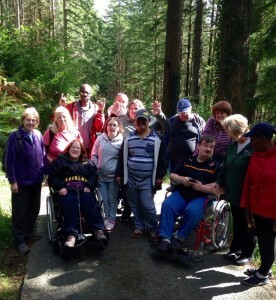 Members and staff of Wolverhampton Gateway travelled to the Towers in Capel Curig, Wales. We set off on Friday evening around 7.00 pm and got there around 9.30pm. We had a hot drink and some biscuits before going our room to make our beds and then went to sleep around 11.30pm. The next morning we got up, got dressed and had breakfast. One of our members was celebrating his 30th birthday with us so we all wished him happy birthday. After breakfast we cleaned up and made sandwiches for the day ahead which was going to be canoeing or walking. The weather was lovely and sunny for us. The lake was really flat and calm and it was a lovely day. In the evening we went the Swallow Falls pub where we took part in a picture quiz, which was great fun. Later that evening we returned to the Towers where some members took part in a game of cards, which was also great fun. Then we went to bed around 10.00. The next morning our normal routine took place before choosing our activities for the day – zip wire, abseiling or orienteering. Later we went shopping in Betws y Coed before getting ready to travel home at 5.00pm. A huge thank you to all the Gateway staff and the Towers staff for organising another great weekend. at Wolverhampton Gateway ended in style. This year we had our Christmas party at our normal venue [Beckminster Church Hall]. We had a buffet meal with hot and cold food to choose from and the room was decorated lovely by the Gateway staff. We had a special guest: Mr Tony Chilvers from Mencap Wolverhampton came to join in our celebrations. Also there were a few presentations too. Certificates were given those who took part in the horse-riding and new members were chosen for the Gateway Forum. Most importantly, the winner of our “code of conduct” trophy was Everton Simpson for his hard work in Gateway and on our residential at the Towers. Well Done Everton! Last but not least a HUGE thank you goes to Mary and the Gateway staff for making a Christmas party so special. “Happy New Year” everyone. See you in 2017. 14th August 2016 Wolverhampton Gateway went on our yearly trip. This year it was to Weston-Super-Mare. Around 40 members taking part in this activity departed from the coach station ‪at 8.00am. When we arrived we all decided which groups we were going to be in. Some members headed for the amusements while others headed for the beach and a walk on the pier. There was also a train ride available to get to the end of the pier which many members took. Once we got to the end of the pier a small group visited a tea room for refreshments after a photo opportunity on a rather large deck chair. Then we went to the beach and buried each other’s feet in the sand. I was even helped out of my chair onto the sand and had my feet buried too. I really loved it. Thank you to everyone who helped me. Some of the members played Frisbee for a while. Later on we went for a fish and chip supper and a walk around the shops. We found a lovely ice cream parlour and we ended up having an ice cream before traveling back and arriving around 8.15 pm. A huge thank you goes the gateway staff for organising such a great day out and to Hills coaches for taking us and bringing us back. It was a very comfortable journey. On 27th August Wolverhampton Gateway went to another successful theatre trip to see the famous Mamma Mia at the Hippodrome in Birmingham. There the staff were most helpful to us. For anyone in the stalls there’s a new addition of small screens so if a disabled person cannot see the stage they can watch the performance on the screen in front of them and they don’t miss a thing. What a fantastic idea! It was a great show and a great day all round.